Over the years, the team of volunteers who restored the first engines for the museum has continued to grow. In 1989, they banded together to form the Association of Friends of the Snecma Museum, then the Association of Friends of the Safran Museum when Safran was created in 2005. At the same time, the museum's collection has expanded to include products from all Safran companies. The museum's volunteers have already restored over 85 piston engines. This is a sometimes daunting task because they have to fabricate missing parts – and the original machines and tooling no longer exist. Furthermore, the absence of blueprints and technical documents for some of these engines mean that the volunteers have to systematically take notes and photos when disassembling an engine to make sure they put it back together the right way! But thanks to their technical knowledge and certain "tricks of the trade", the association's volunteers are always able to overcome these difficulties and complete the restoration. While all association members work on restorations, some of them are also in charge of finding new objects and documents and drawing up inventories. For instance, the engineering schools that used to use Snecma engines to teach their students may donate these powerplants to the museum, expanding its collection. Other volunteers work on improving the museum's exhibit designs, or help publicize the museum. While Snecma's aircraft engines are at the core of Safran's history, other products have been important as well, such as pulse-jets or Gnome & Rhône motorcycles, deployed by the French army until 1960. About 40 of these French motorcycles are on display in the museum. Furthermore, Snecma diversified into many different businesses during difficult periods, producing bicycles, tractors, machine guns, cooking utensils and even sewing machines – and all of these items are on display, along with the aerospace products from other Group companies, such as landing gear, brakes, rocket engines, helicopter engines, drones and more. 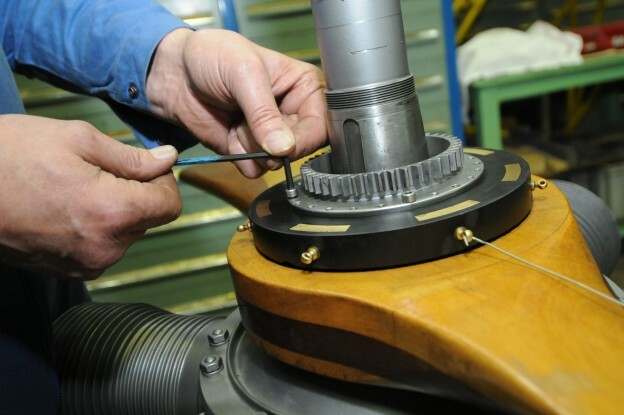 The starting point for the creation of the Safran Aerospace Museum is a shared commitment to preserving and restoring the systems and equipment that have marked the history of Safran. 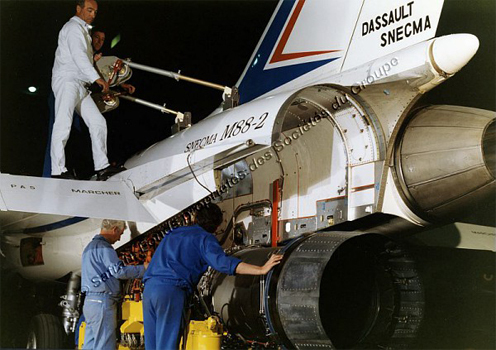 In 1979, the president of Snecma at the time, René Ravaud, learned that the company had few documents about its own history, even though it was the oldest aircraft manufacturer in the world. Snecma had been created in 1945 from Gnome et Rhône, the successor to Gnome, founded in 1905, and other French engine-makers. Rolls-Royce, Pratt & Whitney and General Electric all showcased their own histories through exhibitions recounting the evolution of their engines. The impetus behind theSafranAerospaceMuseumwould come from three men, all Snecma employees and long-time fans of their company's history. At the end of 1984, Claude Moussez, general manager of the Villaroche plant, Guy Dodanthun, CFO, and Bernard Girault, documentation department manager, learned that the Le Bourget Air andSpaceMuseumwas looking for volunteers to restore a thousand aircraft engines in its collection, built by different companies from the beginning of the 20th century to the 1970s. On June 20, 1985, Snecma signed an agreement with the Air andSpaceMuseum, concerning the restoration of these old engines, especially those made by Gnome, Le Rhône and Gnome et Rhône. According to the agreement, two engines of each type would be restored, one for the Air andSpaceMuseum, and the other stored by Snecma for subsequent exhibition. Bernard Girault, named project manager, had two Le Rhône 9 Jb engines shipped from the Air and Space museum, and recruited Charles Gerspach, a technician known for his expertise. Then in September 1985, with support from Claude Moussez, he created the engine restoration workshop at Villaroche. He quickly headed a team of 32 enthusiastic volunteers, all Snecma employees who donated their free time to these restorations. When two of the same type of engine had been restored, one was sent to the Air andSpaceMuseum, and the other kept by Snecma. The first engine to be restored, a Le Rhône 9 Jb, was delivered to the Air andSpaceMuseumon April 23, 1986. However, to consider opening a museum, the absolute minimum was ten piston engines and ten jet engines, all completely restored. In 1987, Guy Dodanthun and Michel Harvey, then chief of staff of the Snecma president, Jacques Bénichou, received his authorization and the funds needed to install the new museum at the Villaroche site. Designed and equipped by volunteers, the museum was set up in the Saint-Chamas hangar, an old seaplane hanger that covered some4,000 square meters (43,200 sq ft). This building had been used as the Gnome et Rhône flight training school when it was in Saint-Chamas, on Berre lake near Marseille. It was disassembled in 1947 and reconstructed at Villaroche, where it housed prototype aircraft for Snecma flight tests for 30 years, until these tests were transferred to Istres. The Safran Aerospace Museum was inaugurated on May 31, 1989 by the President and Chief Executive of Snecma, General Bernard Capillon. The Museum is the only one of its kind inFrance, solely dedicated to aircraft engines, from the dawn of aviation to the present. It also offers an unrivaled collection of Gnome et Rhône motorcycles, most restored by our volunteers. The Association of Friends of the Snecma Museum was created in May 1990, and the following year it received the Heritage Honorary Grand Prize awarded by the General Council of the Seine-et-Marne department for its work in preserving and spotlightingFrance's industrial and technical heritage. In 1998 and 1999, under the impetus of Jean-Paul Béchat, Chairman and CEO of Snecma at the time, a new museum layout was designed and installed. With the creation of Safran in 2005 the association was renamed the Association of Friends of theSafranMuseum. Each year, the museum welcomes nearly 12,000 visitors, who discover some of the greatest successes in the history of French aerospace. A700 square meter (7,560 sq ft) extension was added to the west wing in 2013 to meet safety requirements for a public establishment, which enabled consolidating the association's offices and workshops. This also freed up other space, enabling the installation of a brand-new gallery dedicated to space propulsion. This new gallery, featuring a rich collection of engines, launcher models and satellites, was opened to the public in October 2014. Its layout was designed to help the public understand the principles of launcher and satellite propulsion, including explanations of basic scientific concepts. The birth of space propulsion concepts in literature and legend. The history of launch vehicles and their propulsion systems. Children are offered a more educational, yet fun visit so they can better understand the concepts behind space propulsion.
" During the 1980s, the French Air & Space Museum at the Le Bourget airport held a large collection of aircraft engines. The Association of Friends of the Safran Museum negotiated a partnership agreement with this museum, which would send two of its Gnome or Le Rhône engines to the Safran Museum for restoration. Safran kept one of these engines, which was the starting point for its large collection of historic aircraft engines. " " Safran sponsored several teams of French youngsters that entered the Rocketry Challenge, organized in France by the association Planète Sciences. This sponsorship reflects the Group's ongoing commitment to help young people who are passionate about aerospace. As part of this major international competition to design, build and fly a model rocket, the Museum hosted the design review for the teams of youngsters on March 16, and then the national final on May 18 and 19, 2013. " "The technology collections and museums network of France (RéMuT), coordinated by the "Musée des arts et métiers" science & technology museum in Paris, seeks to "refresh" the image of technology museums and encourage visits by a broader section of the general public. It also encourages specialists in this network to share their resources and knowledge." " The Vaux le Vicomte estate forms a unique whole that spans nearly 500 hectares. It is testament to an era and the fruit of the bold vision of Nicolas Fouquet, Superintendent of Finances under young King Louis XIV. Discover its fascinating history, from plots against the royal court to the outstanding achievements of iconic 17th century artists. " "Dassault Aviation is a major player in the global aviation industry and the only company in the world to design, build and support both combat aircraft, one of the keys to national independence, and business aircraft, a practical solution that supports modern business development." "The Safran Aerospace Museum is located in the Seine et Marne department (77) in the greater Paris area. Seine et Marne Tourisme is the agency responsible for the development of tourism in the department. Its website, www.visit.paris-whatelse.com is a goldmine of information on what you can see and do just east of Paris."